Here's an approximation of my talk this morning to open our Judicatory Green Faith Team meeting; I paraphrased the Ezekiel text rather than reading it, though I've included actuals here. Since we'd scheduled a meeting Friday after Lent 5 and I often default to lectionary because I appreciate both the discipline and the ease, I'd planned to reflect on the first reading for Lent 5A, Ezekiel 37:1-14. When we rescheduled for Friday after Easter 3, I decided to keep the Ezekiel passage. The RCL appoints it for Lent 5 of this lectionary year A and for the Day of Pentecost in year B. As one of our primary resurrection pericopes and also majorly about the gift of the Holy Spirit, it's the eighth reading for the Easter Vigil in all three years A, B, and C.
God called Ezekiel to the office of prophet when Ezekiel was in exile in Babylon; you know how it goes! 4Then he said to me, "Prophesy to these bones, and say to them: O dry bones, hear the word of the Lord. 5Thus says the Lord God to these bones: I will cause breath to enter you, and you shall live. 6I will lay sinews on you, and will cause flesh to come upon you, and cover you with skin, and put breath in you, and you shall live; and you shall know that I am the Lord." 7So I prophesied as I had been commanded; and as I prophesied, suddenly there was a noise, a rattling, and the bones came together, bone to its bone. 8I looked, and there were sinews on them, and flesh had come upon them, and skin had covered them; but there was no breath in them. 9Then he said to me, "Prophesy to the breath, prophesy, mortal, and say to the breath: Thus says the Lord God: Come from the four winds, O breath, and breathe upon these slain, that they may live." 10I prophesied as he commanded me, and the breath came into them, and they lived, and stood on their feet, a vast multitude. The book of Ezekiel is long, influential, and dense; it probably didn't get written-down and readable until after the exile ended, likely around the time of rediscovery of the books of Moses that we read about in Ezra and Nehemiah when Israel / the Jews became a people of the book, so in what order Ezekiel and cohorts originally recorded everything is up for grabs. 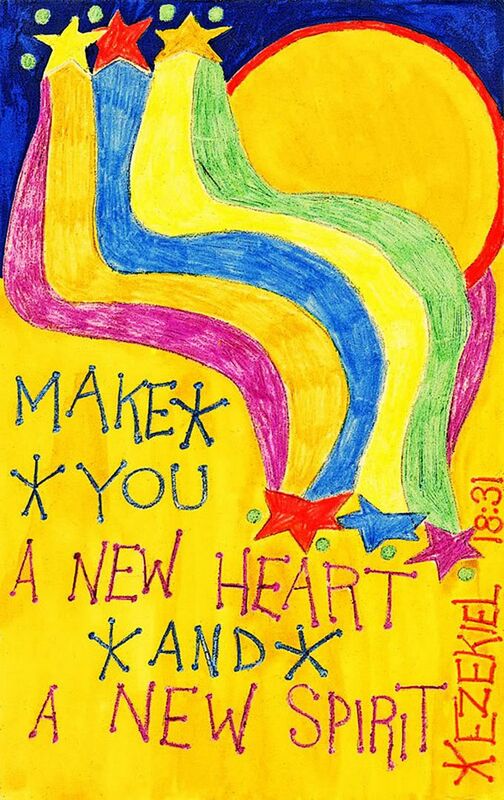 Earlier than chapter 37 I just cited we find three new heart – new spirit passages. God tells the people to get renewed hearts and resolve; God also promises to provided that newness. And why? Primarily for covenantal obedience. Not in order to get the gift, but in response to the gift, to put God first, to keep covenant with and care for all creation. I will give them one heart, and put a new spirit within them; I will remove the heart of stone from their flesh and give them a heart of flesh, so that they may follow my statutes and keep my ordinances and obey them. Then they shall be my people, and I will be their God. We know agricultural valleys as fertile places of great richness. We also know how everything trickles down the mountain into the valley: the beneficial and helpful, the not so good, sometimes the toxic. When an ecosystem is in proper balance, bugs, aquatic life, and other factors help keep it healthy. God showed Ezekiel a vision of literal dead bodies. At least as much as the reality of those physical deaths, Judah felt the death of being cut off from their God in the strange land of Babylon. They also had a sense of death because they no longer were in the Promised Land where valleys had yielded bounty as streams and rivers flowed down the hills. Judah knew Yahweh as a fertility god, but they didn't yet realize Yahweh was not a place god, a deity confined to and connected only with a particular location. Near the end of his writings, Ezekiel shows us the Land of Promise reapportioned amongst the tribes of Israel. Ezekiel was a priest in the holiness tradition of the Jerusalem Temple, the tradition of "You shall be holy, for I, your God am holy!" We sometimes use water as metaphor for the Holy Spirit. Ezekiel brings us a vision of the river of life flowing from the throne of God, into the valley and the desert, out to the sea. He tells us everything whithersoever the river flows shall live, shall be healed. His vision includes trees for food and for healing on the riverbanks. Everything in the path of this river lives because people with the new hearts and new spirits have cared well for the river as part of their keeping covenant with creation. 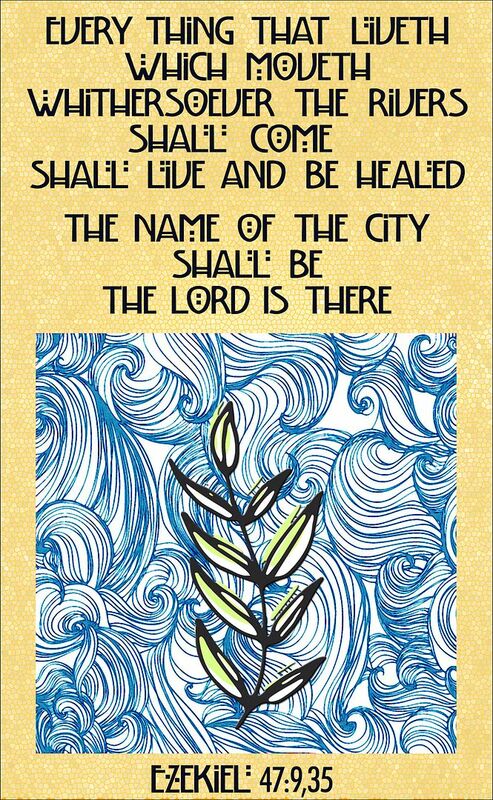 Ezekiel concludes by telling us the name of this city is "The Lord Is There!" God commanded Ezekiel, "the human one" to speak a word of life to the dead bones; to evoke the presence of the Holy Spirit, to summon the Spirit of life! How about us? Does the human gathering of the church speak a word of life? How does the church speak a word of life? When people look at creation, will they see it so healthy and green they'll be able to say The Lord Is There?! Holy God, thank you for these days of May Gray and the June Gloom we anticipate, too, as they help nourish creation. You amazingly claim and call us by water, spirit, and word. May we hear, heed, and obey your charge to speak words of life that help revive the dead in our midst! Thank you for calling us together as your Green Faith Team; please help us complete the agenda for this meeting and offer useful resources at Synod Assembly. In the name of the One Crucified and Risen for the life of the world, for the resurrection of all creation. Amen!